knitted a nice new jumper." It is a deceptively simple story about a group of beings; colorless artwork to begin, little text, repetitive structures. It is, however, deeper than an initial quick glimpse. Oliver Jeffers chooses a colorless palette to help his readers see the Hueys as they are. The lead pencil sketches show endless rows of order and sameness. Every single one of the Hueys is precisely the same as the next one. Nothing sets one apart from the other, no color, no style, no difference in thought. The illustrations clearly portray the masses as an identical society. Even their conversations are blah....well, 'bla, bla, blabity, bla'. Upon looking closely, readers will note signs of color. The announcement from the radio is pastel blue. The background for one of the pages is a light pink. And then, we meet Rupert. He is not content with his lot in life. So he knits himself a bright orange jumper (aka sweater in NA). He seems delighted with it, and he attracts attention from those who are none too pleased with his chosen color. In fact, he causes quite a stir. Gillespie, another Huey, is interested in Rupert's new look. So, he knits a jumper to match. Now, two of the Hueys are different! You know where we are headed, right? It isn't long until Rupert has another brainwave, and perhaps the status quo will change all over again. Don't miss the endpapers. They are such an integral part of the story being told. Nothing needs to be said; the meaning is very clear. It leaves readers to think independently, and to perhaps take pencil (or colored pencil, or crayon, or watercolor) in hand and imagine a Huey of a different ilk. It never ceases to amaze me what an artist can do with just a few lines to show expression and emotion that children easily understand. 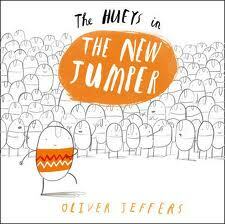 Oliver Jeffers is masterful at it! I'm told this is the first in a projected series of four books about the Hueys. Can't wait to see what this author has in store for us. This one is definitely for those little girls who love to have a say in what they wear....to dress up as the spirit moves them and hang what anyone else thinks! 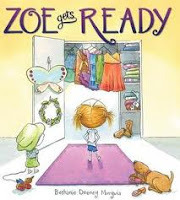 Zoe is pretty amenable throughout the week, as she attends school, takes part in sports, and falls victim to changing weather. When Saturday comes, she gets to have a say. Sometimes, it is tough to determine just which spirit is moving her! Of course, she's not sure about the kind of day she will have and she uses her imagination to guess. It might be a pocket day, and that would mean a chance to collect all manner of special objects to be stored in said pockets. Should she decide she wants to twirl, she would have to choose a totally different outfit. It would be one with a swirly skirt to encourage running in circles and watching it billow to all sides. 'On the other hand', she might want to cartwheel and that means something a little more decorous! Oh boy, such a tough decision. How does a girl choose? The text speaks to the independence in all of us, and the serious business of making personal choices. It takes a concentrated effort to think of all the scenarios that might occur during a free Saturday. Zoe has a fertile imagination and her many choices will delight a young audience. The embossed sparkly cover adds an element of glitz, while the ever changing scenes allow a child to join in the imagining. The bright watercolors, the varied perspectives and the constant motion will have the target audience poring over every detail. Sure to be a hit with those testing independence and wanting a say in their daily attire, and it's a fun story to read over and over again. "Before he left, Bapu asked for my forgiveness. It was a mistake to promise me to a man. A mistake he would correct. And my fate is sealed? In her first novel for teens, Calgary author Cathy Ostlere gives us a compelling and heartbreaking story that barely allows the reader to take a breath. I was hooked from the first page to the last; the fact that it is told in verse and runs to more than 500 pages does nothing to allay the breathless wonder of it. It is Maya's story, but it is told in varying voices. After her mother commits suicide in Canada, she and her father travel to India for the burial of her ashes. It is 1984 and the two arrive on the very night that Indira Gandhi is murdered by her guards. They are Sikhs, as is Maya's father. Chaos reigns, bringing grave danger to all people in New Delhi. It is through a terrifying string of events that Maya finds herself alone in a country she does not know, with no identification and no way of knowing where her father is. "There's no trick to it really. Just listen. Not judge. Once people feel safe it's rather incredible to watch. even cry as they confess their lie or small crime. secret and he recites poetry to her. It's possible her third child is his.)" In the six weeks that follow her arrival in India, Maya must face fear, prejudice, and her future. The complex cultural issues are treated with understanding. Maya is the child of two cultures; her mother was Hindu, her father is Sikh. Their marriage was frowned upon, and not an easy one for either because of differing views of religion and the world. As Maya struggles to find her voice and herself, she keeps a diary and finds love with Sandeep, who becomes Maya's protector. "He gave me a pen too! Oh, how I have missed this voice. This layered, beautiful story is rich in language and emotion and has definitelyfound its own special place on my 'keeper's shelf...and I will read it again. There is much to savor in the articulate rendering of Maya's life as it unfolds once she has landed in India.The author's use of a format which allows for two voices weaving back and forth (from one side of the page to the other) is incredibly effective. I loved the description of this new and unfamiliar country...with its sounds and smells. In that way, it reminded me of The Tiffin and its many clear images of India and its people. then a big solid farmhouse with an ancient red roof. too cold and too tired to hum a tune..."
Piet Janssen loves skating, as most young Dutch children do in the winter of 1941. He dreams of following in the footsteps of his hero Pim Mulier, who was the first to skate the Elfstedentocht, a 200 km route to each of eleven towns in northern Netherlands...all skated in one day! Piet's father makes skates as did his grandfather and his great-grandfather. Piet spends many hours on the winter canals perfecting his skating ability and preparing himself as Pim Mulier did before him. Germany is wreaking havoc throughout Europe and families are being torn apart daily. When Mr. Winkelman is arrested by the Germans for helping the Allied cause, his family is in danger. Piet's father is in England serving with the army. 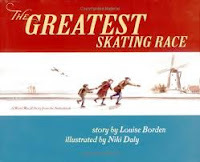 Grandfather decides that there is only one way to take the Winkelman children to safety and keep them out of the clutches of the German soldiers; Piet must skate with them across the Belgian border. but you must look like an unimportant schoolboy. and help them find their Aunt Ingrid's house. who may wish these friends of ours harm." "I tried to remember all my grandfather's words. seeped under my jacket and through my mittens. Then I shrugged off the cold. Johanna and Joop were counting on me." The best books about war and its effect on children are the ones that tell the story without too much drama, and that do not invoke terror in those who are reading about the bravery of children much like themselves who perform selfless acts of heroism while showing the world the resilience and strength of its children. Louise Borden tells her story eloquently and gives us a character to honor in Piet. His determination to keep his friends safe and his calm reaction to danger is evident as the children make their way along the cold canals. Niki Daly's watercolors give readers a clear sense of time and place. She uses a palette of subdued color to match the tone of the story, and to help us understand what life was like in this time of fear and unrest. "Penelope had less trouble deciding what to wear, for she spent more of her governess's salary on books than clothes and saved the rest in accordance with Agatha Swanburne's wise financial advice: "Nest eggs do not hatch unless you sit on them for a good long time." Shortly before eight, she slipped on her best summer dress (which was very much like her everyday summer dress..."
I was definitely looking forward to this book's arrival in my mailbox. I so enjoyed the first two in the series, and I must tell you that I also loved this third one. I know there's going to be another; too many questions are left unanswered, and mysteries left unsolved. Can't wait!!! "It is easier to change one's boots than to change one's mind, but it is far easier to change one's mind about whether or not to wear boots than it is to change the weather." "Busy hands and idle minds have knitted many a sweater; busy minds and idle hands have knitted many a brow." Alexander, Beowulf and Cassiopeia remain true to themselves, keen to learn and achieving more human characteristics with each passing lesson and day. They put everything they learn from their beloved Penelope Lumley to good use. They are funny, more and more articulate and add a happy tone to the day's events. 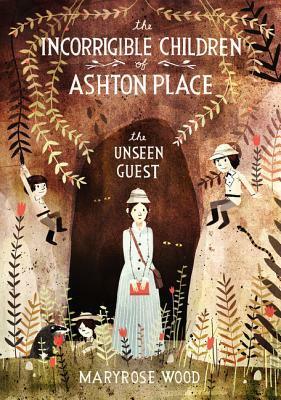 Simon and Madame Ionesco are back and integral to the story, and are welcomed by Penelope and her charges when they arrive to change the direction of a few lives at Ashton Place. "If you now think that you would rather confront a herd of Profoundly Outraged Elephants in a Perilously Oscillating Elevator than hear another word about homonyms, acronyms, or any other kind of nyms - well, think again. There is power in words used accurately and well, and tragedy and missed train connections in words used carelessly." "If Baby Last Dodo had known that he or she would be the final specimen of the dodo kind, would BLD have taken more precautions about avoiding head colds and looking both ways at street crossings and so forth? Alas, we shall never know..."
You cannot help but read such observations a second time. The children are very excited to visit the forest where they grew up while on the hunt for a runaway ostrich. They revert to earlier behaviors that prove hilarious, while very useful in keeping Penelope safe from the elements and from harm. Glitches in the search lead to Penelope taking action to prevent heartache and chicanery for Lord Ashton's mother. Plot twists and secretive behavior leave readers with much to consider as they anticipate The Incorrigibles IV. A great series for middle grade readers...it is worthy of sharing because of its wonderful characters, its mysteries and its humor. Seeing the children in their natural environment adds a new dimension to their story and leaves more questions to be answered. Ostriches, friendly wolves, a medicinal tar pit are part of the ongoing crises faced by the indomitable Penelope and her charges. "Food doesn't have to be fancy to be interesting. Every kind of food, no matter how basic, has ties with exciting history, amazing science, and some very strange stories. One kind of food travels halfway around the world to reach you; another comes from just down the road...your favorite fruit could come from a desert in Africa, and your favorite vegetable from a mountainside in Peru." Mission: Delectable is a worthy food tour through the seven days of the week. Each of those days helps readers make surprising discoveries about the food that they might find in their lunchbox on a regular basis. A whole lot of research has resulted in a readable, intriguing look at everyday foods. 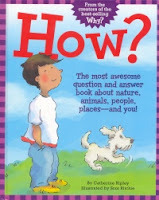 Questions are answered that I would never have thought to ask...and that is the beauty of this book! The task is to keep a food diary for a week...taking note of all food eaten at lunchtime. Each food is then considered in terms of history, and science. Two or three of the foods consumed make the cut for information sharing. A checklist on the top of the page shows which food item has been described and the one that will follow. There is much to learn about the foods that many of us eat regularly, plus so much more. I would love to share those that captivated me and had me rereading certain pages, but the list is long and you would have no need to buy the book for yourself if I did that! The format of the book, and the information contained within its pages, will inspire some readers to push further in the research to add to the already shared tidbits. As we search for books that interest our children in the food they are eating and inspire them to take a more active role in trying to eat 'right', this would be a great addition to any library. The added bonus is that each of us can learn a lot from the dedicated research done by Claire Eamer. Great illustrations accompany the 'delectable tidbits' of information being shared. Never too texty, it is totally accessible to interested readers. Attractive, colorful illustrations will catch the reader's attention and the design is sure to appeal. There is humor here, and even some silly shenanigans. a number of jokes and puns pepper the pages, and will leave readers with funny bits to share with others. 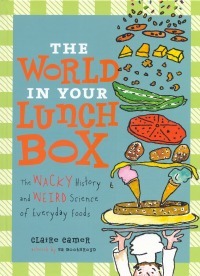 The book ends with a list of top ten fun facts about food...surprising and informative. A list for further reading is supplied for anyone who might long to know more than what is included here, and there is a bibliography as well. "Like all microbes, germs are always trying to multiply, or make more of themselves, to keep living. When germs move into your body and start multiplying - FAST - your body fights back. You run a fever, which helps fight off the germs. But it sure makes you feel yucky. This is the first page I read this morning, as I fight the annoying and aching feelings of a summer cold. Bah! Humbug! The worst of it is that I am visiting with a wonderful, caring friend who thinks that she needs to coddle me, and make sure I take care of myself. Since I have a touch of laryngitis, it is hampering our visit to an extent. My kids would say it is a lucky reprieve for Lorna; but, neither of us is feeling that way! It doesn't even really help to know all this book has to say about germs. It won't help the cold, as the germs have taken over and it will just have to work itself out. Alas, woe is me! Kids will love this book filled with nearly 80 questions asked by Jake and Lizzie of their Oma. Off they go together to a variety of venues and each inspires questions that include why, who, does, what happens when, and where. The places shared in the course of the visit are a birthday party, the library, a pet show, Jake's sick bed, a trip to the beach and an airport farewell. So much to learn and remember! "When asked if she's always conscious of the children's voices, Ripley responded, "Kids are so engaging and they're so honest, and they come at things so differently than I do as an adult." She added, "It really pays to go back into the classroom again and again. You get taken aback by the wonderful world we live in, as seen through a child's eyes." Ripley works closely with artist Scot Ritchie on the illustrations and the layout. As an example of how they collaborate to make sure the words and pictures work together, she pointed to a nine-step explanation for "How are roads built?" It could have come across as complicated, but flows very logically for readers if they simply follow the road itself, like a pathway through the numbered steps. An advantage to conceiving of How? as a complete book from its inception was that Ritchie could feature a single family throughout." The collaboration pays off in fun, cartoon-like artwork by Scot Ritchie that will capture the attention of the target audience. He gives personality to each of the main characters, and takes us on a journey that will help kids remember much of what they are learning. This book is an exceptional and welcome companion to last year's Why?. "Gomez was the spiritual leader, and Yonni Barrios, who had had a bit of medical training years earlier, was the doctor. Everyone was occupied. They had a goal, a purpose. No one was permitted to go off alone for very long. "We worked hard for our own rescue," Urzua explained. Every light Pena turned on and every chore that each team completed tied them together, and gave them hope." When I was teaching and working as a teacher librarian, I tried to remind the children in our school that we are living history each day. One hundred years from now people will not know about our lives unless we write about them. They will not know our story unless SOMEONE writes it. They will not be able to 'Google' us unless we leave a legacy, or a map to follow so that there will be a record of life as it is lived in 2012. We can tell our own stories. When we look at historical writing from an earlier time, we are thankful that someone was forward thinking enough to realize that. Much of the research that students do concerning historical events is now available online, through interviewing someone who lived then, watching video of all types, listening to audio that describes a time past. Even adults often fail to recognize that what is happening to us today will be of interest to someone at a future time. A lot of our students would have some knowledge of the Chilean mining disaster two years ago...it was reported daily on television and in newspapers. Why the publicity? Haven't there been other mining accidents? 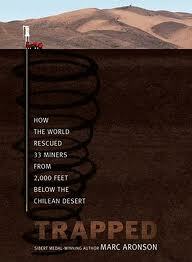 Have other miners not be trapped underground in places nearer to most of us than Chile? Of course, they have. In most cases, the death toll is reported and little else except to nearby communities whose lives are forever changed by such events. This collapse was different. This time the thirty three men trapped so far underground in the San Jose copper mine were alive...and the world wanted to keep apprised of their story and the many people involved in trying to bring it to a happy ending. Was it possible to find them? Could they be saved? How would they bring them to the surface of the earth once more? As I watched I had so many questions about survival, about living in such an environment (hot, cramped, with little to eat or drink in the first days), about claustrophobia and darkness (I absolutely knew I would not survive such terrors), about safety from further collapse, about family above ground, about rescue. Marc Aronson does his best to answer many of the questions that readers might ask. If you, as I did, watched the rescue with admiration and bated breath, it is a memory that will never be forgotten. I watched as each and every miner was brought to the surface with tears in my eyes and joy in my heart for their families, for the miners themselves and for the ending to that part of their story that united many in a collective sigh of relief! Marc Aronson's book reads, at times, like the best adventure stories...compelling, tense and imaginative. The characters are immediate and their story is personal. We feel their plight and we cheer their collegiality and their humanity under the most terrible circumstances. We admire the many who strove to keep them alive, to find ways to communicate with them, to feed them and to develop the tools needed to bring them safely from so far below the surface. It was extremely enlightening to read Marc Aronson's included section on his writing of this book: having no previous sources to consider since the disaster was so recent, there was no cache of gathered information to use as source notes, no few thousand 'Google' hits to help tell the story of the thirty three miners who were living the story as it unfolded to the world. Kids will be wowed by his sharing of his process. It makes a compelling argument for original research wherever possible. Backmatter includes brief biographies of each of the thirty-three miners, a timeline, a glossary, a word on “The World of the Miner” by a miner, a note to students, notes and sources, a bibliography, a list of interviewed subjects, useful websites, and an index. This is a book that will be very much appreciated by anyone interested in world events, and by those who, like me, were totally absorbed in the plight of so many men, their families, and the many scientists and engineers who worked worldwide to bring their story to a satisfying conclusion. I owe a lot of memories to Maurice Sendak and his wonderful books. 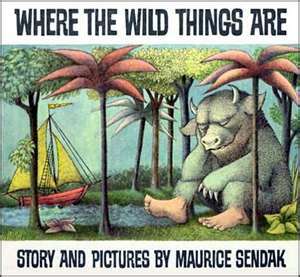 Where the Wild Things Are was a favorite readaloud night after night at home, and day after day at school. We couldn't get enough of Max and his shenanigans. What child did not, or does not, live vicariously through such a brilliant character? Then, while teaching in my second school and spending all of my extra time working in the library there (there was no school librarian), I ordered In the Night Kitchen and caused a mighty stir. Our principal saw the baby's naked wee body (and that it was a boy!) and put a halt to it being included in our collection. New to that job, much younger than I am now and not yet willing to fight the book banning, I paid for it, put the money with the overdue book fines and it remains part of our home collection to this day...some thirty years later! "It is my involvement with this inescapable fact of childhood–the awful vulnerability of children and their struggle to make themselves King of all Wild Things–that gives my work whatever power and passion it may have." Power? Yes! Do we not still dream at times of being 'wild things' and leaving all constraints behind so that we, too, may be part of a 'wild rumpus'? I think that we might. Fantastic as it might seen, it gives wings to our wishes and allows us to dream. Home to a warm supper and familiarity, once more. Rest in peace, Mr. Sendak. "More than ever, the children who volunteered at the Center focused their attention on Hana. Led by Maiko, some of them formed a group with a mission to let other kids know about what they were learning. They called their club "Small Wings." Once a month, they met to plan their newsletter. Everyone had a role." I was totally captivated by this book when I read it ten years ago, and there are few details that I no longer remember. How wonderful that Karen Levine felt the story worthy for a larger audience, and that she did the research needed to bring Hana's story to us. It was the suitcase that sparked the interest, and the passion of Fumiko Ishioka in Tokyo where she was director of the Holocaust Education Resource Center that brought it to us. I am sure she had no idea that the story of Hana's suitcase would have worldwide appeal and bring her so much attention. In this new book, published as a tenth anniversary album, we hear the story of Hana and her brother George through careful and thoughtful research, and how that research led to the many discoveries made about Hana's death in Auschwitz. It is a reminder to all of us that we must not forget the atrocities of the past. It has been published around the world, and Fumiko, Karen and George have shared her story with too many children and audiences to count. A children's group called Small Wings hopes to instill awareness and compassion for the plight of those we do not know but for their stories. Those who read the book and see their work will see the world through Hana's eyes, and do what they can to change their small part of the world, and their community. Only through tolerance and acceptance can we hope to make the world a better place. Hana has a lesson to teach in every classroom, on every playground, in every school. Ten years later, we hope that it is still happening...or we can read her story again as a reminder. It is a legacy never to be forgotten. In this new album, the author has included new pages of photos, art and writing done by children who were inspired to have their say...visually and orally...after seeing Fumiko, hearing Hana's story or participating in Holocaust Memorial Days. It is worthy of your attention and should be shared with all children over the age of 8. It gives us pause to consider others in our world, and that is a wondrous thing. "In Bess, Harry found both a life partner and a new partner for his act. She was a tiny woman - less than five feet tall and under a hundred pounds - which made her a natural for squeezing in and out of the trunk in the Metamorphosis trick. And it turned out that audiences were more interested in a husband-and-wife magic act..."
I loved reading about Harry Houdini in this very accessible and compelling book. I had no real knowledge of him, and his life. That is no longer true! Janice Weaver does a most commendable job of bringing this complicated and fascinating man to life. As you can see from the cover, Harry Houdini had great presence. He was born in the late nineteenth century to a rabbi and his wife and was brother to four siblings. His birthplace was Budapest, but came to the United States and settled in Appleton, Wisconsin where his father led his synagogue for four years, before he was let go. This led to great poverty for a family of seven, and young Erich helped by working hard to help sustain them. He left home when he was only 12 years old on a path to find a good life. While still quite young, Ehrich Weiss changed his name to Harry Houdini and began working in a sideshow. There, he toiled to reinvent himself and that led to fame and fortune throughout the world. He lived a life of celebrity; a magician of renown, and then a brilliant escape artist whose feats dazzled the world and led to many imitators. He beat the Chinese water torture cell, handcuffs, jails and he tempted fate on many occasions. He worked hard but had luck on his side, too. His wife worked at his side, and encouraged his many feats. He was a great hit with his audience, offering to pay all in attendance if he failed in his attempts to escape from a wide variety of seemingly impossible predicaments. He never failed to support his family and left a legacy that spoke of the love he had for each of them. The author adds winning sidebars that will up the interest for those who aspire to be magicians or those young readers with an interest in the history of the time and the world of sideshows and magic. Using newspaper accounts and photographs, memorabilia, period advertisements and accompanied by the full color artwork created by Chris Lane, readers get a clear picture of life as it was lived by Houdini and his family. The section at the back that references further reading and websites will add to the wealth of information already shared in the text. An index also proves helpful. 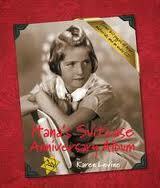 This would be another great addition to a collection of picture book biographies...and you know how I love those. "He made his first public appearance as a Cub Scout. While a fellow Scout tried to tell jokes, Jim stood behind him, wrapped his arms around his friend's chest, and waved a white handkerchief in his face. Everyone giggled. Making people laugh - to Jim, that was magic." Oh, our family loved to sit down and watch The Muppet Show together. I recently bought its three seasons for each of our three houses, and it is a wonderful reminder of great times spent laughing and repeating dialogue from Statler and Waldorf, the Swedish chef, Rowlf and the others. Now that my family is spread across the country, the shows are one of those things that connect us to an early happy time. The characters remain fresh and lovable. The variety shows are so much fun! Jim Henson begins at the beginning; a young family with no TV. Jim loved to draw and create from his verdant imagination, and he loved being outside where he could watch and admire all that nature offered a young boy. In high school, he chose to join the puppetry club and also got a job as a marionette for a Saturday morning television show. It was his first job in a field that would hold his interest for the rest of his life. In telling his story, Kathleen Krull describes the way he created what were to become his beloved and still flourishing Muppets. Using flexible fabric rather than the wood that was used for most puppets at the time, he was able to give lifelike expression to Fozzie, Kermit, Miss Piggie and a host of other beloved characters. For those who may not know much about the 'guy who played with puppets', this is a useful introduction to his life and his art. He was a consummate artist and family man, who worked diligently to bring his Muppets to a worldwide audience. His work did not just include the Muppets, but also characters such as Yoda, of Star Wars fame. He had abundant energy and was always working to perfect his art. The writing is clear, and unencumbered. 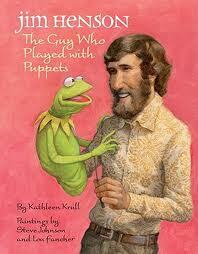 Young readers will gain knowledge about Jim Henson, his life, his family and his creativity. It is a lasting legacy for a man who died too soon, and before he had accomplished so much more. The artwork created by Steven Johnson and Lou Fancher is filled with color and offer constant reminders of the many recognizable and much-loved Muppets brought to life through Jim Henson's vision. The allow us to see how Jim and his many co-workers manipulated those puppets, and from what angles, to entertain us so thoroughly over all these many years. Another picture book biography to add to my ever-growing list and one that ensures Jim Henson's life story will inform a new generation of readers. Pair it with Joan Holub's Who Is Jim Henson? to help interested readers and researchers learn more about this creative genius. There are many bits of 'didja know' to enhance the learning and wow the audience. His life was celebrated with color and joy upon his death...a fitting tribute to the man who brought such joy to children through his many wondrous puppets. Additional sources are cited for anyone wanting to know even more. If you can look back on life at home with your parents, or you have young children now, you might want to take a close look at this heartfelt book from Dan Yaccarino. 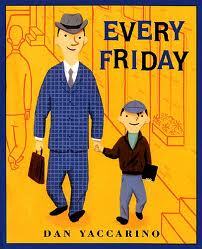 It concerns a weekly ritual between a father and his son. Each Friday morning they head off together. As they walk along neighborhood streets, they peruse shop windows, chat together, greet the regulars, and make their way to their favorite diner. It doesn't matter the weather; nothing gets in the way of a father and his son taking time to do something special and familiar each and every Friday. As they wait for their order to be delivered to their table, they chat about things that are important to them. They watch the people inside the diner and outside, and enjoy each other's company. It is a tradition to be savored and protected. The artwork is done in bold color, clear images and reminds me of growing up in the 1950s. Check carefully for the reminders of times past that this distinguished artist chooses to share with his audience. Each spread allows the reader insight into the joy that the two feel in spending time together. The warmth of those weekly walks is evident in the warmth of the background colors chosen and the mood created. 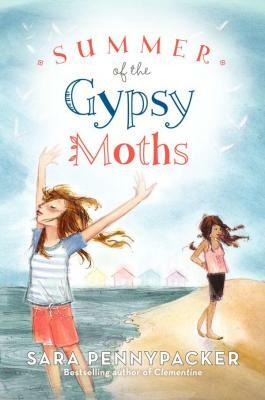 It serves as a great mentor text for use when encouraging young writers to consider memoir, and family traditions that others might like to read. A walk around that memory will add details that make the writing personal and poignant. Nothing like a fond memory, or a family ritual to encourage that! They belong to all of us, and will be eagerly shared given a safe and accepting place to do the writing. Father's Day will be upon us before we know it. If you are looking for a story that your son might share with his father or grandfather, look no further! "Where the shingles had blown away, the roof began to leak, and soon there were rotted places where the rain fell inside. When a roof goes bad, the rest of the house follows, and before long, the house was beginning to collapse, its nails rusting and pulling loose and its walls pulling apart at the corners." Ted Kooser sure knows how to write a compelling story about nature and its ability to sustain itself, despite our best efforts to keep it from doing so. While we tend to try and keep it under our control, it consistently proves that it will get the better of us when push comes to shove! The house that is the setting for this story stands next to a dense copse of trees and shelters a man and his young children. The father wants to keep the land surrounding that house pristine. So, he carefully mows every square inch, and keeps any tree seedlings from taking root by pulling them from the ground manually if need be. Never another tree dares show its leafy beginnings in any spot close to the house! When the children leave home, the father continues mowing his lawn with precise perfection. The yard work becomes cumbersome and he makes the difficult decision to sell. It seems to have no appeal for a new buyer, and remains uninhabited for a long period of time. The result is that the house falls into ruin, with a leaking roof and sagging walls. Left to its own devices, nature does what nature does. The seeds take root in the lawn and along the foundation of the house, watered by rain and without any constrictions. While the house itself rots and begins to lose its shape, the trees that have taken root provide a barrier to total destruction and lift it up into their leafy branches. together as if it was a bird’s nest in the fingers of their branches." I am happily becoming quite familiar with Jon Klassen's artwork. He seems particularly prolific lately and he never ceases to impress with the moody palette that adds visual meaning to the words of the books whose pages are graced by his talent. Here he uses yellow, red and muted green to show the spare expanse of lawn, the father removed from his children and their lives, and the solitary house standing apart from the beauty of its natural surroundings. His use of light and shadow add to the beauty and power of nature, allowing the reader to see the aching sadness of the barren yard alongside the joyous abundance in the nearby woods. It is a story I read again and again for the beauty in the telling. 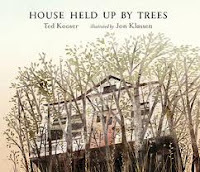 Ted Kooser fills his tale with rich and meaningful language, and the glorious power of a natural setting. There is something about it that consoles the heart as we watch the house become part of nature once more. "A Palm Cockatoo is a regular one-man hard-rock band. He whistles and bobs his head. Then he breaks off a stick to drum against a tree. The message is clear to other males, "Stay away! This is MY tree."" 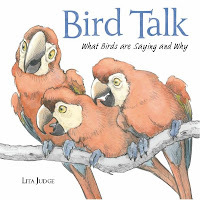 Kids with an interest in ornithology will love this new book by Lita Judge. 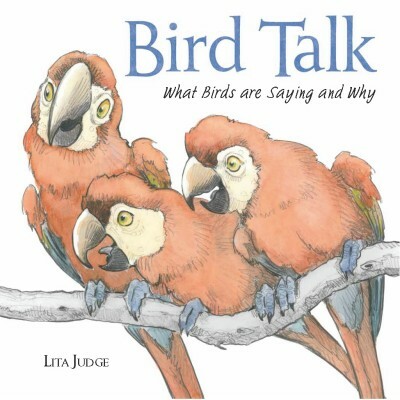 It introduces more than twenty birds in clear and accessible text that gives useful information about many aspects of a bird's way of communicating. Most of those included will be familiar to its young audience if they have an earlier association with birding or bird books. Others are from distant parts of the world, with similar ways of making their voices heard. These beautifully rendered birds are shown sending messages by voice, plumage display and other means of letting their intentions be known. They woo their mates, keep themselves and their young safe in a variety of ways, and offer gentle encouragement as their fledglings learn to take to the skies under their own power. I went back again and again to read the research shared. There are two spreads for each pair...the first one showing some way that birds communicate with and to each other while the other gives meaning and offers more examples of each type of behavior. Her artwork makes clear each bird's meaning and adds humor to our understanding. The cover is a prime example of the appeal and invites us in with great delight. There is plenty of white space, and that allows a close, personal look at many species, often male and female alongside each other. The artist's attention to detail and obvious careful research makes this a book that will find a welcome place in both home and school libraries. The beautiful colors, the expressive movements and the methods of communication used in such variety make this an exemplary book for young researchers and offers a useful format for presentation. A picture glossary clearly describes the birds that Lita Judge has chosen to include for our enlightenment and entertainment. It proves most useful to children who read it and their parents. How many buttons are left?" 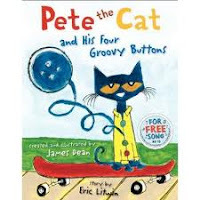 If you are a Pete the Cat fan, or if you know little ones who are, you will be understandably excited to read his newest adventure with counting and clothing. Pete's wearing a brilliant yellow shirt that sports 'four groovy buttons' and each one is a different color. The buttons are large and easy to see, adding vibrant tones to the already noticeable shirt. Pete is beloved by many after his new shoes (great for talking about colors) and his dancing shoes (a journey through a day at school) got them clapping their hands, tapping their toes and singing his songs. It's fun to anticipate what might come next. Here, Eric Litwin uses counting to add to Pete's teaching repertoire. He does it with another 'groovy' song, and an interest in numbers. It's counting backward which is the layman's term for subtraction. With each lost button, listeners are invited to guess how many buttons might be left on the shirt. Talk about fun! Even more humorous is what Pete discovers when his shirt buttons have all popped off. Repetitive language, a familiar character, rhythmic verse and known responses make this another hit for the preschool and early years crowd. They will lap it up, singing along and laughing out loud. The artwork remains the perfect accompaniment to the text, with bright colors, expression-filled action and the comfort of setting in a series book. Children will know what to expect, and will love every minute shared with Pete once again. The rumor is that there will be a new Pete the Cat book this fall just in time for Christmas, and with a Christmas theme. How cool will that be? "Marcel couldn't have know it then - he was only five - but these were the last days of the silent movies. The first "talkies" had already appeared, and movie audiences loved hearing the actors speak. People would soon forget how to enjoy silence. But Marcel would remember." Marcel knew he loved entertaining others from a very early age. He loved Charlie Chaplin and the silent movies that he saw. He knew what he wanted to do with his life; but, life as he knew it in France changed dramatically with the declaration of war by Germany. He worked, as a teenager, helping Jewish children cross borders to safety and ensuring that identity cards for Jewish children were changed to keep them safe from the Nazis. He used his considerable skill at acting to help quiet the children as they faced unknown danger. He changed his own name from Mangel to Marceau to ensure his own safety. Despite the many changes in his life, Marcel remained focused on his dream - to revive the old art of mime. He entertained audiences whenever he had the opportunity and even studied with a world famous mime named Eitenne Decroux. True to his desire to help those suffering during the war years, he did shows for the Allied troops, always working to perfect his character Bip. For many years, and with well deserved accolades, he used his body, his facial expressions and his audience's imagination to delight and charm. His career lasted fifty years, never speaking a word. Imagine that! I, for one, would never make it through the rigorous training challenges that would have me remain silent while entertaining for long periods of time. Readers and listeners will learn much about the entertainer himself and about his world. The text touches on some of the events of WWII without any of the true horror experienced by those living through it. We come to know him as a hero to many as he worked with the French Resistance, and also as a man filled with the determination to make a difference in the lives of those who came to see him perform. He was famous throughout the world, and his audiences admired his enormous talent. His World of Mime School in Paris carries on his legacy of communication without language. I think that both author and illustrator prove themselves exemplary in their collaboration for this fine book. 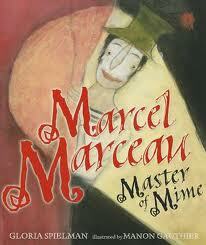 Gloria Speilman chooses her words carefully and poetically to relate Marcel Marceau's great talent for mime. Manon Gauthier takes us back to Marcel's world from his earliest days with expressive, wondrous spreads that seem to be placed perfectly on each page. The colors are spot on to create the historical setting, the imagination of the art of mime, and the changing mood from stage to wartime terror. It's always fun to read a new story from Mem Fox. She works so hard to create perfect text that generates excitement for new readers and makes it accessible enough that they can soon be reading the book themselves. No one is a better ambassador for young children and their reading than she is...and she makes it fun, fun, fun! If kids don't think that reading is a wonderful way to spend their time, they won't really want to do it. Mem Fox knows that, as do many others. This is just the kind of book we want to get into their hands! I know that I have mentioned this before: she says that if we read just twenty minutes each day to our children and grandchildren, we would wipe out illiteracy in one generation! Twenty minutes is doable, isn't it?? Monkeys, rhyming text and adventure. It's always fun to see what trouble monkeys might find themselves in; here, they play in the grass until fear forces them to the security of a nearby tree. It won't be long until you hear a two-year-old rattling off the rhymes. They will be clapping their hands and tapping their toes to the music in the verses. They might even jump rope to it when they get a little older. Mem Fox doesn't like writing for young children because she finds it very difficult, indeed! That is evident in the careful choices she makes concerning words. 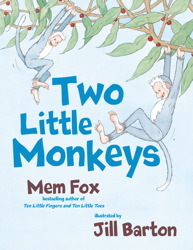 Here she uses great verbs...peep, leap, scramble, tremble and others to help children understand the monkeys' antics and to entertain them as they share the joy in the tale. I often used the entire Mem Fox collection as an author study when working with grade one children. 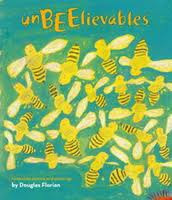 The stories are just right, and the varied and talented illustrators bring life to those words so carefully written. Jill Barton uses watercolor tones in gray, blue and tan to focus on the mood for the reader. They capture attention and offer comfort as the pages are turned. The scenes offer clues to the upcoming action, and assurance that the monkeys will be just fine. 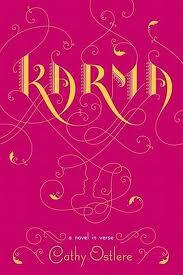 It definitely begs repeat readings, and is sure to be memorized with great delight. Add this to your list of books for a baby shower! set off on a new adventure. 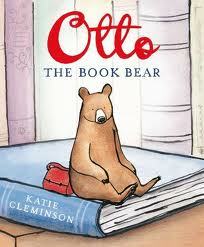 Otto lives in one of my favorite places in the world - a book! He is delighted when people take the time to read the book where he lives, and can't think of anything that might make him happier. It is only at night that he comes to life, and chances a change in his daily routine. It is then that he takes some time for himself...wandering the house in search of adventure, reading his own particular favorite books and working on his authoring skills. When the family moves away, Otto is inadvertantly left behind and his life takes a quick turn. Otto has no choice. He must find a new place to live; and so begins his big adventure. He leaves his book, his shelf, his room and his home. And he sets off across the city. There are worries, and fears and much gloom for Otto on the unfamiliar city streets. Finally, he finds the perfect place for a book bear! This one will be just right to add to any list that includes books about books, and libraries, and a love of reading. I like Katie Cleminson's bold black outlined illustrations and her use of strong color when sharing Otto's big adventure with us. She uses that color to change mood, and to bring peace. There is lots for an eager listener to see as the story is being read, and it affords opportunity for discussion and discovery. "Forensic art blends art with known facts. Forensic drawings or sculptures are usually made for purposes of identification. One form of forensic art, in which a sculpture of a face is re-created using the measurements of the skull, is called "facial reconstruction." 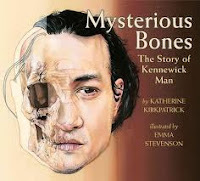 This is a most interesting introduction for middle graders and high school students to the Kennewick Man, whose skull was discovered on the banks of the Columbia River in 1996. The men who made that discovery had no way of knowing its impact on science and history. If you watch the television series Bones you will be cognizant of the concept of forensic science and facial reconstruction. This skeleton was found to be in quite remarkable condition and caused a dramatic furor. Thus, Katherine Kirkpatrick begins with that. The issue at hand was respect for the cultural and ancestral traditions of the person whose bones were found on that riverbank. It took nine years in the judicial system before a judge made his decision. He agreed that the bones could be tested; the determination was made that the skeleton was not a descendant of any known modern culture. Further scientific determinations could then be made. Now, the skeleton could tell its own story. Slowly and methodically his secrets were laid bare to the world at large. Some of the discoveries made concerned his diet, what had caused body trauma to his hip and forehead, how he lived and what his environment was like. All were questions of real interest to the scientific community, and to the history of the region. "In the basement of his house in nearby Richland, Chatters carefully spread out the bones on his laboratory table. There were more than three hundred bones in all. He placed the skull at one end of the table and then arranged the other bones., many still covered with dirt, according to their place in a human body. Studying bones was like doing a puzzle, and Chatters loved a good puzzle." I found myself intrigued with the many excellent illustrations that Emma Stevenson created using gouache on watercolor paper. There are tools, maps, and an especially detailed page of what the Kennewick Man might possibly have looked like. The author includes many colored boxes that add further information to her written text. She ends with an extensive glossary, a timeline that spans the years from 1990 to the present concerning ancestral claims to human remains, a bibliography, source notes and an index. There is a lot here to read and understand. In the end, it is informational text of high caliber and will please a captivated audience. "Then, leaving the child in tears, she entered her cold, dark iglu. There she sat with poisonous thoughts swirling round her head, until her mind at last cleared. But before she could so much as think over what she had said to her grandson, there came a dreadful squeal from outside." I have truly enjoyed every publication received from Inhabit Media. 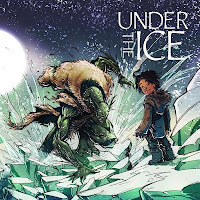 I think that they are doing a superb job of bringing Inuit traditional stories to a new generation, one that has been influenced by movies, cartoons and comic books. In telling this tale from traditional lore, the art director chose to use images inspired by comic books as they would be familiar to the intended audience. They will definitely find fans. I have vivid memories of reading a story from Robert Munsch and Michael Kusugak called A Promise is a Promise (Annick, 1992) and meeting for the first time the ice monsters known as Qallupilluit. They were scary and I was sure that any cautionary stories about them would have kept me back from the ice edge. In this compelling tale an old grandmother is caring for her young grandson, and experiencing great difficulty doing so. There is never enough food, he is inquisitive and exuberant and she lacks patience. One day he wants food and will not hear that they have none. She loses her temper and makes a wish that the qallupiluq will come and take him. In fact that is just what happens! The childd is taken and the grandmother spends endless days filled with guilt and longing. Finally, she convinces friends to look for him, for there have been reports by hunters of seeing a young boy playing out on the ice. How had he survived? The hunters finally find him, but he proves elusive and we learn that he is protecting his new family. They have treated him with love and kindness and he wants to stay with them. Will he be caught? A great story, well-told with appealing artwork and touches of terror and great love. Not one of those boys ever phones! Oh, Bret's going to hear about this! I am the complaining mother of a grown son. I KNOW that he loves me and has no need to announce it telecommunicably as often as I would like. So, I am part of the same whining group as the Queen in this beehive! "Bees give us sweet honey. This informative poem is accompanied by a short nonfiction paragraph further explaining CCD, and faces a watercolor illustration of one bee on a sea of greenish blue, eyes open in wonder and apparently unmoving. "The queen bee is fed royal jelly, a protein-rich paste, and eventually becomes the largest bee in the hive. Worker bees tend to all her needs, feeding and grooming her around the clock. During breeding season, the queen lays as many as 2,000 eggs a day, creating a colony of up to 80,000 bees." Pretty powerful leader, isn't she? Let me end with something that I feel very strongly...we should be sharing poetry with our kids every day. If we don't, they miss the joy and wonder of rhythmic language, articulate and talented writers, and the sheer fun of reading aloud with exuberance and shared laughter or tears. They will consistently discover new favorites and will soon be memorizing some without even working at it. If you have a reluctant reader, it's a great way to get them to try reading something that is not overwhelming and can be a lot of fun! Go for it! Douglas Florian is a great place to start but don't stop there! We are blessed with a bevy of accomplished writers whose poetic abilities astonish. Check them out! an opening slowly fills with light. "Who is warming me, Mama?" "That is the sun," Mama says. 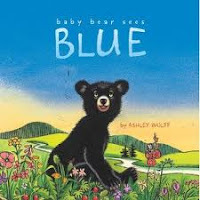 I was delighted to read on the back flyleaf that Ashley Wolff has always had a soft spot for Mama and Baby Bear in Robert McCloskey's Blueberries for Sal. This lovely story took some of its inspiration from that story. I have read that story more times than I can count, and it maintains a constant spot of my list of all time favorites. That is due to the feelings it evokes of shared bedtime reading with my own kids, story time in kindergarten and sharing personal favorites in workshops with teachers, parents and librarians. Now, I have another favorite to add to that list! Baby Bear is a delight, as most toddlers can be! He awakens in his mother's embrace to sunlight and a day filled with questions. How else to learn about his world, most notably the colors? His curiosity and wonder engage he and his mother in the world that is his neighborhood. Everything is new, and worthy of that wonder. We wander with the two as they explore the many small adventures that make up a young cub's day. Always protected, ever curious, with a Mama who is endlessly patient, Baby Bear takes in these new lessons with ebullience. The illustrations that Ashley Wolff has created to accompany this grand adventure are stunning. She printed lino blocks in black on Arches Cover paper; then hand colored them with watercolor to give a sense of energetic enjoyment of all things in Baby Bear's world. Readers will find so many images to hold their attention, and many small details to discover. A mouse discretely watches the dark opening of the bears' cave, blue jays sing a song for Baby Bear, a grasshopper cautiously keeps watch and brilliant red strawberries tempt taste buds. Mama's tender looks and Baby Bear's excitement are evident on every color washed spread. "I happen to be very good at cleaning. Not everyone is. Oh, sure, everyone can do a basic job - it's not climbing Mount Everest, or performing brain surgery. But to be really good at it, you have to develop an eye - that's what I call it anyway, after an art teacher once explained about being an artist. I have developed an eye." What are Stella and Angel to do when they come home from school to find that their caregiver, Stella's great aunt Louise, has died? Both girls have had miserable experiences with real and foster families. Stella's Mom is fragile and has proved herself to be incapable of caring for her child, often leaving her alone for days at a time. Once, after being on her own for too long, Stella calls family services and is given into the care of Louise, a crusty older woman who lives on Cape Cod and runs a summer vacation cottage rental company. Angel's parents have died, she has been in other foster homes and comes to Louise at the same time. Louise is hopeful that the two be friends. The girls are polar opposites and have a most difficult time finding, or wanting to find, any common ground. When Louise dies, they are terrified that they will go back into the system. Stella fears that her mother will never find her. She is always hopeful and optimistic that they will once more be a family. Angel is waiting for her Portuguese aunt to make a home for her. Their terror leads them to lie, to hide Louise in the house (keeping the smell in check with liberal spraying of Febreeze). Finally, they decide that they will bury her in the garden and take care of the cottages and themselves until someone shows up to provide guidance and a home. If you know and love Clementine you will know what a great storyteller Sara Pennypacker is. Here she proves it once again with a story that is charming, humorous and emotionally gripping. The two girls struggle to work together, and to remain in the home they have come to love. It takes time, patience (which is not easy for either of them) and a secret bond to help them understand the true meaning of family. There is suspense and an uncomfortable acceptance of the choice they make in dealing with Louise...but the love they come to share is strong and enduring. I love Stella's orderliness and her dependence of Heloise (and her many useful hints) to help her deal with problems as they arise. She has a wonderful spirit and her first person narrative is observant, strong and genuine. Angel is a force to be reckoned with, and she is a feisty match for Stella...in all things. Stella remains optimistic despite the many setbacks and constant worry over the discovery of what they have done. Angel is tough, pessimistic about life and family. Together they make a great team, and a pair of unforgettable characters.